As we transition from summer to fall, vegetable lovers everywhere are mourning the season’s end of some of their favorites. Perhaps the loss felt most deeply is that of the tomato, the vegetable that comes in more colors than Joseph’s coat. No true tomato lover will bother with anything other than fresh off the vine. However, one summer vegetable continues to grow to new heights: the humble okra. My plants are just over six feet tall now and will grow at least another two before I take them out for the year. This stately garden giant is either loved or hated. Often maligned for being slimy, okra has so much more to offer than the average vegetable. 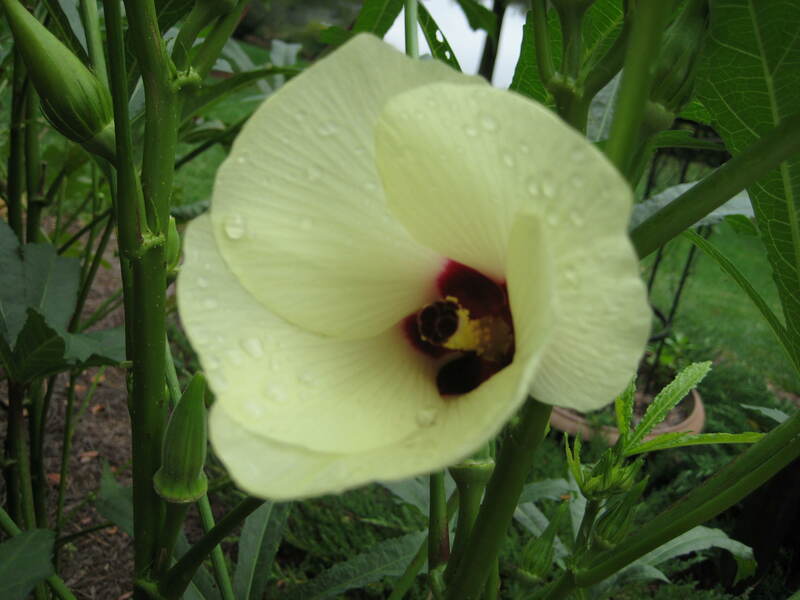 It is the only one that provides a beautiful flower, evidence of its family relationship with the hibiscus–creamy, pale yellow petals with a deep burgundy center. The pods can be pickled, canned or frozen. They can be dried and make a great crunchy snack. Stir fried with a little olive oil, garlic and salt is a quick fix for supper. They can be stewed and play well with the above mentioned tomato. Finally, if you eat nothing else fried, sacrifice your restriction for a little fried okra. It should be hot, crunchy and not greasy. You can make gumbo without the roux; you cannot make gumbo without okra. Our newest neighbors from African countries often leave the pods in favor of cooking with the leaves. And if you leave the pod long enough, it grows to what I call weapon size. Oversized pods can be dried and used in a variety of craft projects. Clearly, many among us have no respect for this versatile vegetable. I hope this exposition on its many fine qualities will help bring some of you over to the sunny side of loving the humble okra. I vote for fried okra! Definitely a summer favorite for me, but the batter can’t be too thick. I love a little salt and pepper on mine!